Be guided through 5,000 years of game history and discover the wealth of the Swiss Museum of Games collections. Guided tours are personalized according to the profile of the group (children – teenagers – adults -senior citizens – intergenerational). Please contact us for a solution adapted to your desires. The Museum invites you to come and celebrate your child’s birthday of with his/her friends. After the activity an attractive room in the Museum or its terrace (in good weather) is put at your disposal. You only have to provide the snack, drinks and if you wish decoration. This offer, only valid in the afternoons from Tuesday to Sunday, is for children under the responsibility of an accompanying adult. 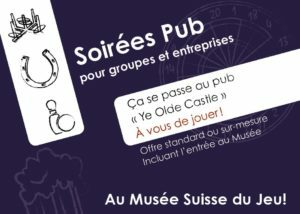 No matter what your profession is, the Swiss Museum of Games offers a specially adapted workshops for companies who wish to organise a team-building activity involving games. In a friendly atmosphere, discover how games can put a large number of skills and abilities related to the world of work in practice: cooperation, strategy, communication, etc. The choice of games is adapted to meet your specific needs, which makes this workshop a real tailored-made offer. Price: CHF 80.- per person. Our game workshops are intended for kids, including schools, as well as adults; they are adaptable to various age groups, expectations and the needs of teachers and / or the person in charge of a group. You can support the Swiss Museum of Games by making a donation or leaving a legacy. The Foundation of the Swiss Museum of Games, in its quality of institution of public use, is tax-exempt. Therefore, monetary donations in favour of the Foundation of the Swiss Games Museum are deductible from your income tax on your declaration form. Account: Banque Cantonale Vaudoise | Konto H5070.63.02 | IBAN CH35 0076 7000 H507 0630 2 | BIC/SWIFT : BCVLCH2LXXX. The Friends of the Swiss Museum of Games support the development of the museum and its collection and improves contact with the public. With your contribution as a Friend of the Museum you not only support the museum in its work, you also benefit from various advantages. Join us and become a friend! - 22, 29.07 and 5.08.2019 "Fête des Vignerons"